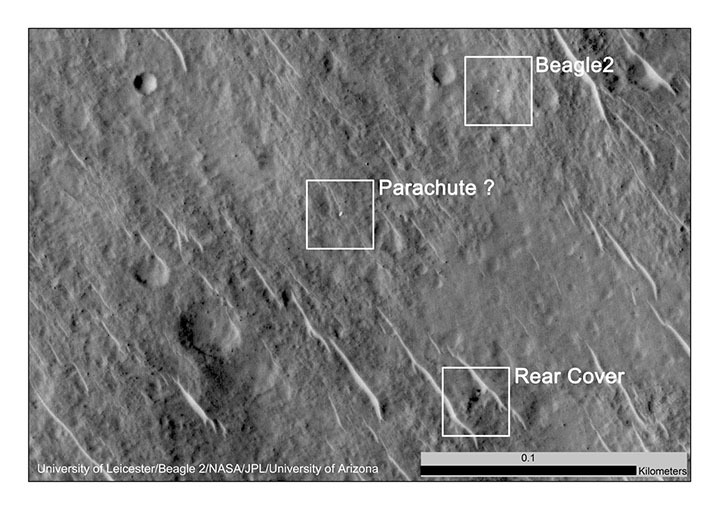 The Beagle 2 Mars Lander, built by the United Kingdom, has been thought lost on Mars since 2003, but has now been found in images from NASA’s Mars Reconnaissance Orbiter. A set of three observations with the orbiter’s High Resolution Imaging Science Experiment (HiRISE) camera shows Beagle 2 partially deployed on the surface of the planet, ending the mystery of what happened to the mission more than a decade ago. They show that the lander survived its Dec. 25, 2003, touchdown enough to at least partially deploy its solar arrays. Beagle 2 hitched a ride to Mars on the European Space Agency’s long-lived Mars Express mission. It was a collaboration between industry and academia designed to deliver world-class science from the surface of the Red Planet. “I am delighted that Beagle 2 has finally been found on Mars,” said Mark Sims of the University of Leicester, U.K. He was an integral part of the Beagle 2 project from the start, leading the initial study phase and was Beagle 2 mission manager. “Every Christmas Day since 2003 I have wondered what happened to Beagle 2. My Christmas Day in 2003 alongside many others who worked on Beagle 2 was ruined by the disappointment of not receiving data from the surface of Mars. To be frank I had all but given up hope of ever knowing what happened to Beagle 2. The images show that we came so close to achieving the goal of science on Mars. This annotated image shows where features seen in an observation by NASA’s Mars Reconnaissance Orbiter have been interpreted as hardware from the Dec. 25, 2003 arrival at Mars of the United Kingdom’s Beagle 2 Lander. The image was taken in 2014 by the orbiter’s HiRISE camera. This entry was posted in Mission News and tagged Beagle 2, ESA, lander, Mars, Mars Reconnaissance Orbiter, mission, MRO, NASA, orbiter, spacecraft on 2015-01-16 by Heather Dalton.